He has done his schooling in Campion Anglo Indian Hr. Sec. School, Trichy. 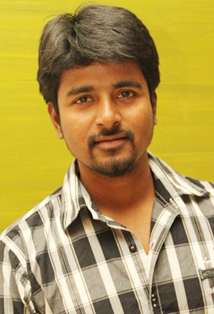 Sivakarthikeyan's father was Late.Mr.G.Doss who was a police officer. His grandfather is a Padmashree award winner for Nadaswaram. His native place is Thiruvizhimizhalai near Thiruvarur. He has done his schooling in Campion Anglo Indian Hr. Sec. School, Trichy. He has completed his Bachelor of Engineering in Computer Science and Engineering at J. J. College of Engineering and Technology, Trichy and MBA from Indian Institute of Planning and Management Chennai. His Sister is a well known doctor in Trichy and he lives along with mom and wife in Chennai He got engaged to Aarthi who is his relative on 16th May 2010, and got married on 27th August 2010. He won Kalakka Povathu Yaaru and got chances to participate in three dance-reality shows : Vijay Jodi No:1 (pairing up with Aishwarya), Boys Vs Girls season 1 (by winning the Best Entertainer Award) and Boys Vs Girls season 2 (by winning it).He did host many Vijay tv programs.He did a minor role in an ad for Vivel along with Trisha Krishnan. He then got opportunity to anchor several shows, events and interviews like Jodi No:1 Junior, Jodi No:1 season 5, Adhu Idhu Edhu... . He gave his voice to the movie Pattalam along with Premji Amaran. He did two well known short films : Mugapputhagam and Identity. He also did 360°, pairing with his close friend Priya, directed by D L Vinod.